When the cast of Star Wars Episode IX was announced, one name most were pleasantly surprised to see listed was that of Carrie Fisher. The actress who played Princess/General Leia in five Star Wars films from 1977 to 2017, passed away unexpectedly in late 2016 (after he scenes for The Last Jedi had been completed). The cast announcement revealed that Leia would be brought back for Episode IX using footage that had been shot, but not used, for The Force Awakens. "I couldn’t be more personally thrilled and happy that our Carrie will reprise her role as Princess Leia in the new and final Star Wars Episode IX, using previously unreleased footage of her shot for Star Wars: The Force Awakens. As we, her family, as well as her extended family of fans around the world so believe, Carrie’s ‘Princess Leia’ is forever entrenched in the franchise and her indelible presence is fundamental to the film. J.J. Abrams understood Carrie’s iconic role, and he has masterfully re-crafted this final entry to include this unused and very last footage of Carrie ever taken, without resorting to CGI or animatronics. Our family and her fans will look forward with great anticipation for this one!" 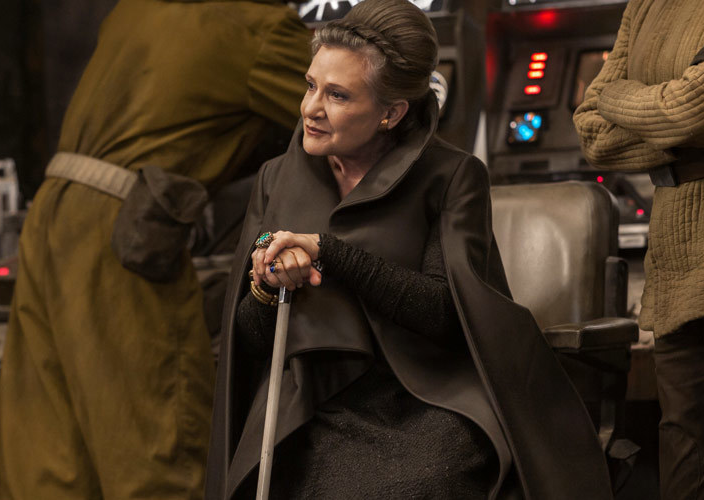 Other members of the cast of Episode IX shared their thoughts on moving forward with the Star Wars films without her. Luke Skywalker actor Mark Hamill tweeted, "It's bittersweet facing my final chapter without her-She is simply irreplaceable. I'm finding solace in the fact that she won't BE replaced & would love the worldwide outpouring of affection from those who loved her when they heard the news." Finn actor John Boyega, shared Hamill's sentiment adding, "We will get through it dad #CarrieOnForever"
Star Wars Episode IX hit theaters on December 20th, 2019. The film is directed by JJ Abrams, with a script by Abrams and Chris Terio. The film stars Daisy Ridley, Adam Driver, John Boyega, Oscar Isaac, Kelly Marie Tran, Mark Hamill, Billy Dee Williams, Lupita Nyong'o, Domhnall Gleeson, Keri Russell, Richard E. Grant, Naomi Ackie, Joonas Suotamo, Billie Lourd, and Carrie Fisher.